Erin explains the Building Quality Curriculum service. 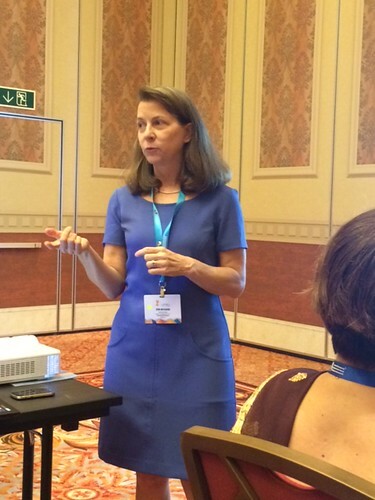 This post is a series of my learning from the International Baccalaureate Asia Pacific Region Conference in Macau in March of 2015. IB offers a large suite of services for IB schools. They are started a “school enhancement” service department based on feedback from schools in 2012. This is to help schools post-authorization and for schools approaching the 5-year review or evaluation. This particular workshop is given by Erin Albright, Head of Post-Authorization Services, IB Global School Services and explains the Building Quality Curriculum service, which is one of the four services under the enhancement department. The goal of the service is to give more timely feedback to teachers to improve the planning of curriculum. A school using Building Quality Curriculum would submit unit plans and self assessment to the IB. The IB provides written feedback and the school then has a month-long period of conversations between the PYP program of inquiry, units of inquiry and MYP unit plans. The IB school selects 6 PYP and 2 MYP (16 unit planners) subject units, completes a self-assessment and submits the units plus UOI. They piloted it with 26 schools in 2014. Participants thought it was helpful for schools approaching evaluation and it was a great starting point for coordinators working with faculty. 84% of the schools did not use the month-long period of questions/conversations. The 2015 pilot is inviting schools to participate and the goal is to find 60 schools. The application deadline is July 24, 2015, documents are submitted in September, and feedback comes back mid-November. (GSS@ibo.org) – Global School Services email. The fee is $385 for the six PYP planners and $880 for the MYP. Plans for 2016 – It will be offered as an optional service for PYP. Mandatory at program evaluation for schools not participating in eAssessment. This is an optional service for other schools. This BQC will replace the monitoring of assessment because IB thought that the it was too late to improve learning to be looking at the assessments and so they hope that the earlier feedback on the planning side of the learning will be more beneficial. As a counterpoint, the assessment focuses on students and the unit planners focus on the teachers.